Ladies and gentlemarks, we've got a quiet week this week, which makes it an opportune time to resume my Antartica trip reports from my vacation a couple of months ago! When we last left off, my friends and I had spent a night camping on Antarctic soil--er... ice--on a tiny island in Leith Cove, and we had just returned back to our ship, the Ocean Diamond. There was no rest for the weary, though, because breakfast came an hour after our return. By mid-morning, it was time for another excursion! This time, it was Neko Harbor, located just one strait over, west of Danco Island and Leith Cove from the previous morning and evening. It was a relatively gloomy day on this, our second full day in Antarctica--not quite as gray and drab as Deception Island, but a notable contrast from the beautifully sunny skies of the day before. Nonetheless, the scenery that surrounded us was spectacular. Massive, snow-capped peaks sprawled upward all around, with sheer faces of dark, black cliff exposed every so often. What astounded me wasn't the fact that I was seeing snow on mountains located right next to water (though I also found that unique). It was the sheer amount of ice pack clearly visible on top of the rock, hugging the mountains like a thick, snowy sweater. In some places, the packed snow seemed to defy gravity, sliding over a ridge but not quite falling off. The morning landscape in Neko Harbor. A snowy peak, heavily packed in a deep layer of ice, dramatically textured. In the water, we also spotted beautiful icebergs slowly being consumed by the sea. We could see the bands of eroded ice wrapping around the perimeter. Since most of an iceberg's mass is underwater, as it melts, the iceberg actually starts "rising." This alters its center of gravity and results in a constant rebalancing as the berg drifts through the water, and the resulting bands provide an exquisite story of the slow decay of these massive floes. 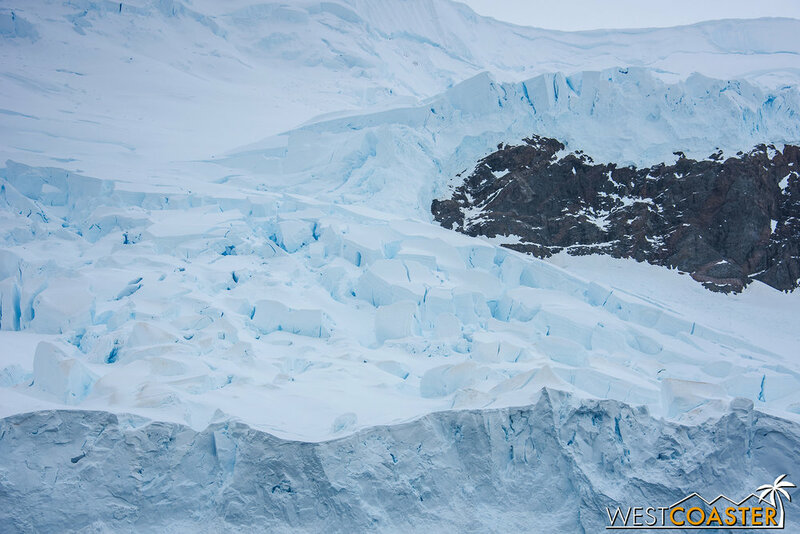 Large icebergs carved by the water are floating works of art crafted by Mother Nature herself. These bands showcase the water erosion and told the story of the iceberg's age and evolution. Some penguins call an iceberg home. Our prior excursions on this trip so far had each featured some unforgettably unique aspect integral to their sites. Deception Island had been moody and otherworldly--a volcanic ghost in the ether. 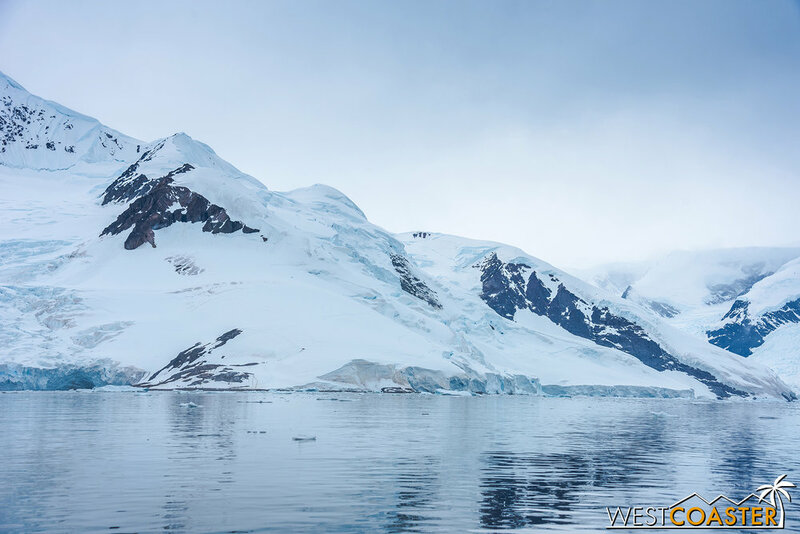 Danco Island was our first glimpse of spectacular, resplendent Antarctica--mountainous terrain surrounding a chilly channel. Paradise Harbor yielded a look at research life on the 7th Continent and a particularly elevated overlook high above the coast. And Leith Cove had hosted a camping experience and incredible sunset for the ages. Neko Harbor continued this trend, and its contribution to our trip was: whales. Although the winds were unstable as we set out to begin loading for our cruise, they calmed by the time we actually boarded. While the other half of the ship headed to land, we set off to search for whales passing through the area. And wow, did we get whales! 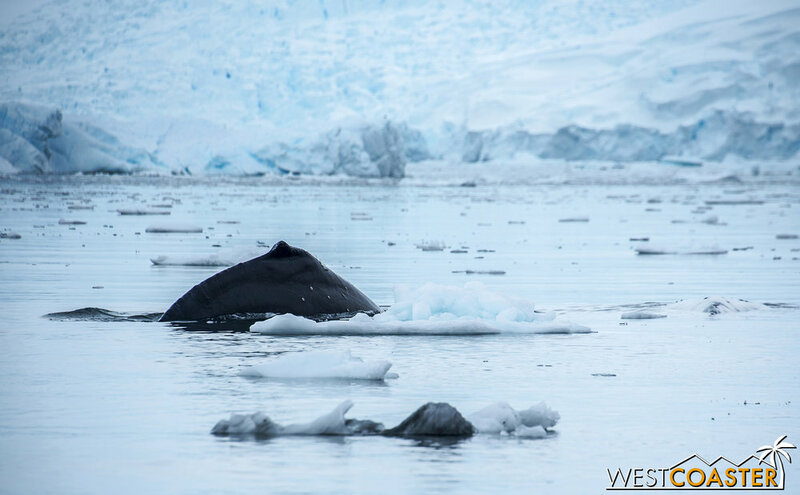 A humpback whale surfaces in front of a Quark Expeditions Zodiac boat. Close-up of a humpback dorsal fin cutting through the water. No more than ten seconds after our expedition guide had pulled off the floating dark, ramped up the throttle into cruising mode, and announced our whale-spotting intentions did we hear what would quickly become the unmistakable sound of a whale coming to the surface for air, cresting through the waves with a sleek jet of air and spray, announcing its presence. It was a humpback whale, and we set off in pursuit. It was but a minute before we pulled close enough to observe the humpback from a safe but still intimate distance. We were in luck, for our whale had not come alone. A couple of other humpbacks were in accompaniment, and they lazily drifted on the water, taking in the now-peaceful morning. A second humpback joins the scene. Cresting above the waterline after a breath before diving down to feed. A different humpback whale drifts in the morning waters, napping peacefully. We fell into a pattern. We'd see a group of whales somewhat in the distance and head over to get a closer look. The whales would often drift in the water, dorsal fins protruding above the surface, taking in air every now and then. Inevitably, they would arch through the water, finishing with a fluke of the tail waving momentarily over the water before diving down for more food. It was a surreal and enchanting experience. I had never really seen a whale in the wild before--an unsuccessful 4th grade whale watching field trip being my only previous experience--but being able to spot them and hear them now gave a fluttering feeling of awe. To call them majestic creatures seems stereotypical, but that was the adjective that came to mind. These whales were massive--a scale that photos rarely seem to adequately capture--and they were here, in the wild, in their own element. We were guests in their domain, and it seemed like a privilege to observe them in their habitat. A fellow traveler readies a camera to catch the perfect shot. After our first sightings, we were soon joined by the kayaking group. Being in man-powered vessels, they were allowed to approach the whales more closely than we could in our motored Zodiac boats. And I can only imagine what an sensational feeling it must have been for the kayakers to take on an even more intimate encounter of these aquatic mammals. I made sure to get photos of both the whales and the paddlers, knowing this would be a moment they would never forget. And even now, as I reflect on my trip overall, this morning cruise excursion remains one of the highlights. Kayakers approach in a group. A kayaker gets a closer view of a pair of humpbacks. Experiences like this make the steep $1000 upcharge for kayaking (covering the entire trip) much more worth it! A penguin checks out what a kayaker is photographing. A humpback whale sends a spray of water as it surfaces for a breath. Ultimately, we ended up seeing over a dozen whales in total--a significant amount that is not common for most tourists to behold! In this way, we were very fortunate. By the time the other half of our overall expedition had boarded their Zodiacs for their harbor cruise, many of the whales had moved on, continuing their feed elsewhere. Even by the span of an hour, the experiences they had were different from ours. By the midway mark of our time at Neko Harbor, it was time to switch with the land screw and take a hike--literally. Bidding fond farewell to our cetaceous friends, we made our way to the coastline for our second continental landing of our trip. A rocky beach landing for those going ashore. The theme of our second half switched from whales to penguins, which was no surprise. This was Antarctica, and penguins were literally everywhere. At Neko Harbor, though, we found a population even greater than what we had encountered the previous day. 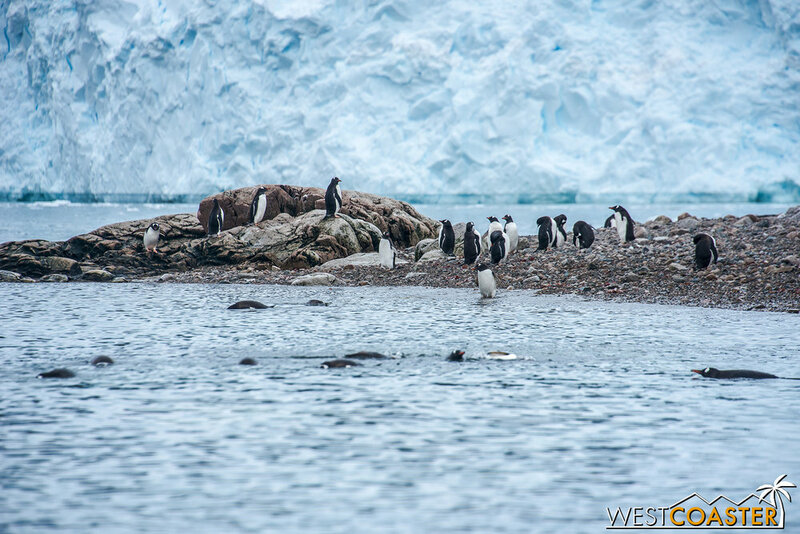 Gentoo penguins greeted us all along the coast, and our hike up to our chosen overlook featured a plethora of rookeries scattered across the rocks. Penguins line the beach and observe their new visitors. Heading uphill after landing. Hiking poles were provided by Quark for convenience. Not only did we see penguins, however. We also had the fantastic opportunity to see baby penguins. Indeed, what's cuter than a regular penguin? A penguin chick! And there were dozens (hundreds?) all around us. Sure, we had spotted a few chicks the previous day at Danco Island, but the quantity there was dwarfed by the number of tiny wuzzies on shore at Neko Harbor. From our research before the trip, January seemed to be an ideal time to see penguin offspring, as most penguins would have been hatched across the previous month. We found this true at Neko Harbor and the other sites we would visit. Nests were bountiful with the little chirps of hungry chicks waiting for food from their parents. In some cases, the chicks appeared to be a few days old and hardly visible from under the tufts of their parents' warm feathers. Others were more developed at a few weeks old slowly starting to gain a familiar avian form. And still others were at least a month old and growing large and fluffy. 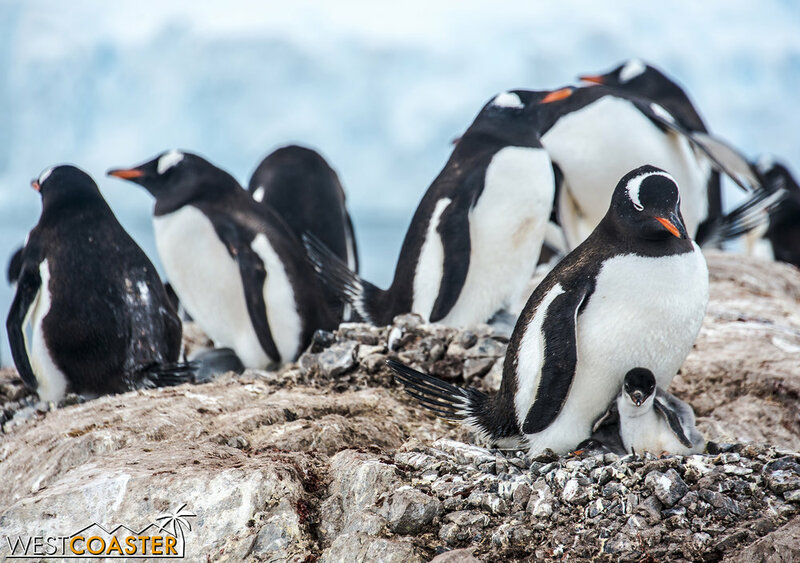 Just as it was an amazing sight to see the humpback whales so close and in person, the penguin chicks proved to be a memorable and adorable sight. Obviously, my fondness for penguins in general was already pretty great, but seeing the tiny offspring so early in their lives was an emotional high. It made sure to snap plenty of photos zooming in as much as I could to capture the beauty of Antarctic life. From penguin chicks feeding out of their parent's beaks to siblings nesting together for warmth, I gleefully took in this real life National Geographic scene in front of me. 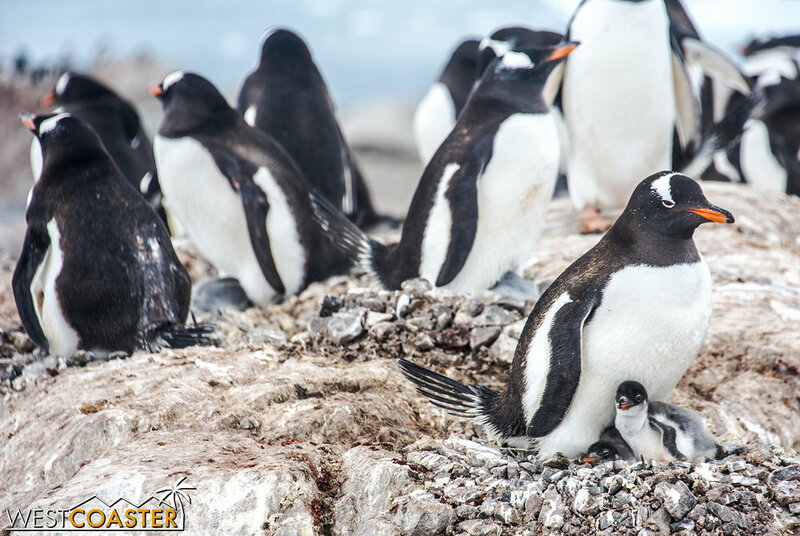 A gentoo nurses a penguin chick. This baby penguin is likely no more than a week old. 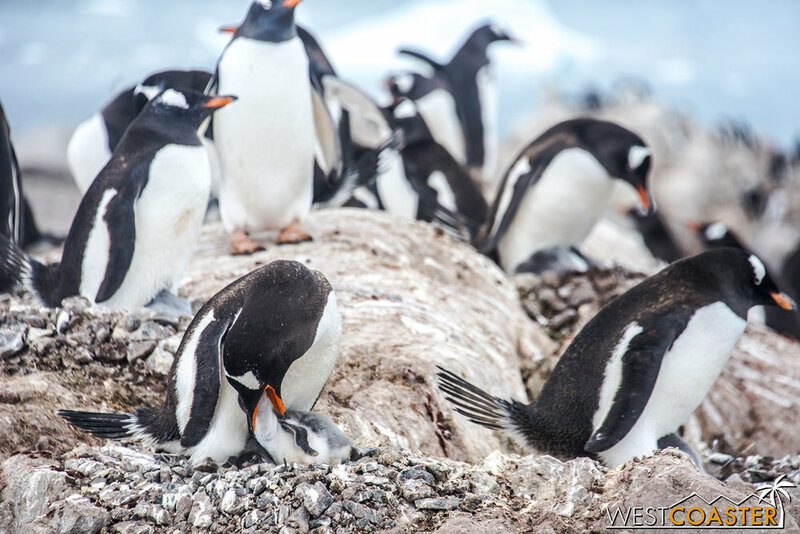 Gentoo penguins typically lay two eggs, so seeing a pair of chicks at a nest is not uncommon. Just as we had seen "penguin highways" at Danco Island before, so we crossed them at Neko Harbor. This afforded us a few close encounters at times when we paused on our hike to let a penguin seemingly stumble its way downhill toward the rocky beach in search of food. It also allowed those who might be slightly winded from the uphill climb to catch their breaths, since even though the overall elevation gain wasn't that great compared to a typical hike, doing so on snow or ice increased the exertion! A penguin trudges through the snow off kilter. Fellow excursion goers observe a penguin on its way downhill. As we climbed higher and higher, we encountered more and more penguins. This reinforced how impressive it was that a penguin--with all its sleek, aquatic-favoring design that functioned clumsily at best on land--could make the same ascent every day from the water to its nest in order to feed its young. 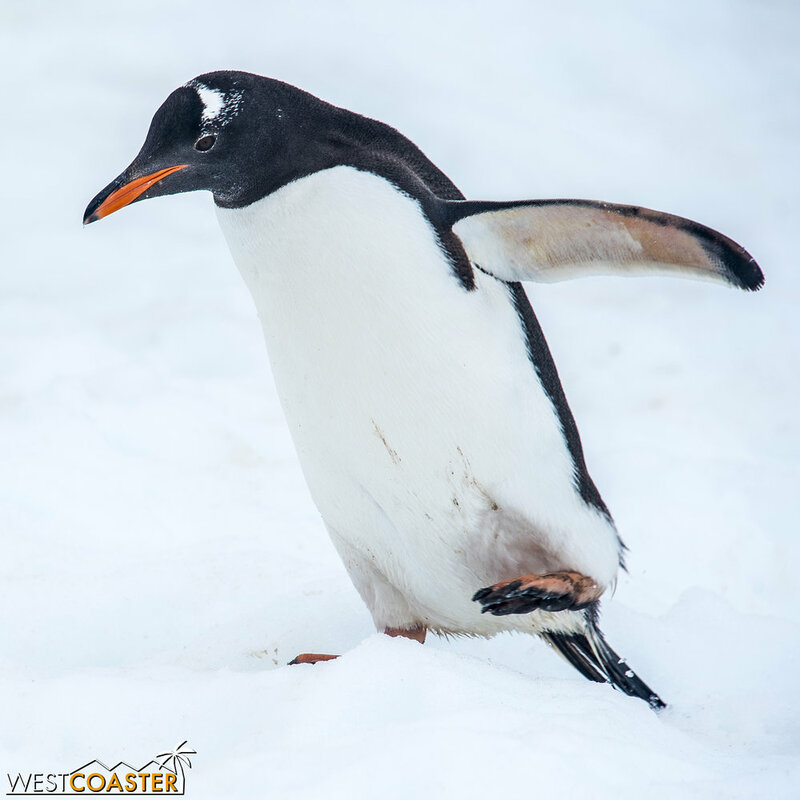 We might have climbed several hundred feet vertically, but for the much smaller gentoo, with its squat lower body and rolling center of balance, making the hike up must have felt like several thousand feet! The Ocean Diamond rests anchored in the harbor in the distance. A couple of gentoos in front of a snowy, mountainous backdrop. A chick feeds from the beak of its parent, who regurgitates food. Our arrival at the top rewarded us with sweeping views of Neko Harbor itself. The mountainous snow peaks immediately around us stood in stark contrast to the gray and cloudy expanses beyond. 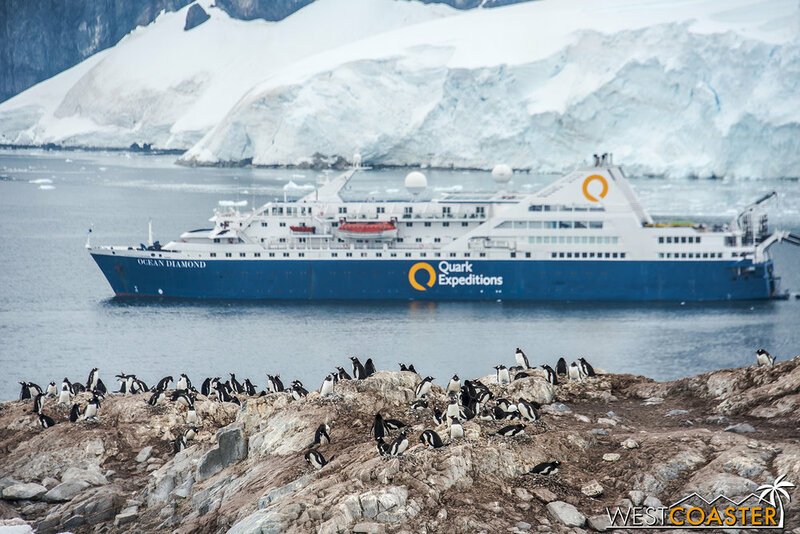 Our Ocean Diamond, by no means a small cruise ship under any standard, seemed to be a toy boat in this Antarctic tub. And though the morning remained cloudy with flat light, we nonetheless marveled at yet another example of the amazing landscape. An overview of Neko Harbor. The expedition guides collect the trail marking flags on the way down. Once again, all too soon, we had to make our way down. I lingered as one of the last non-guides to make his way down, and I took notice of how the expedition guides collected the trail-marking flags as they followed me back to the beach landing. It occurred to me that this meant that they were literally setting new trails at every landing we made--a pretty captivating thought that made me appreciate the true spirit of adventure in which we were partaking. In my mind, these trails had already been laid out and were waiting for us, the Antarctic tourists, to enjoy. 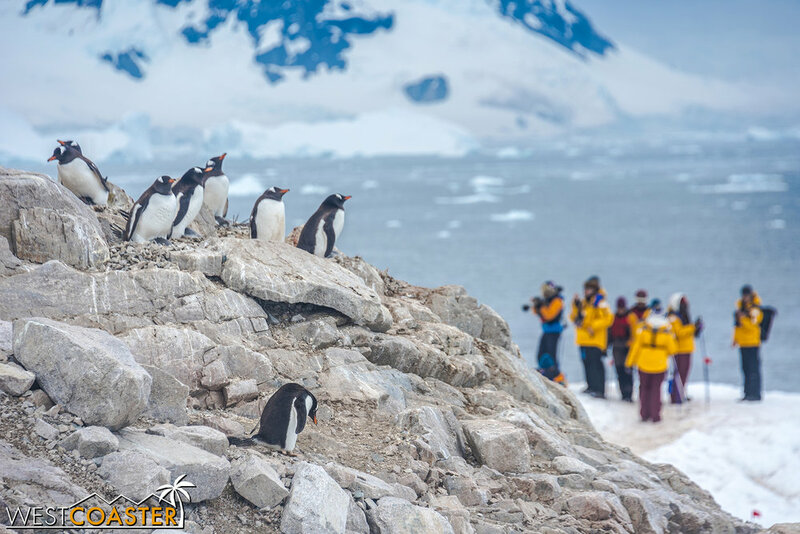 But in reality, though the sites might be known to the tour operators, each trip and each visit was a new mini-exploration, as guides set the best path given the available conditions. We headed back to the Ocean Diamond before noon to recharge with food and get a little more rest. 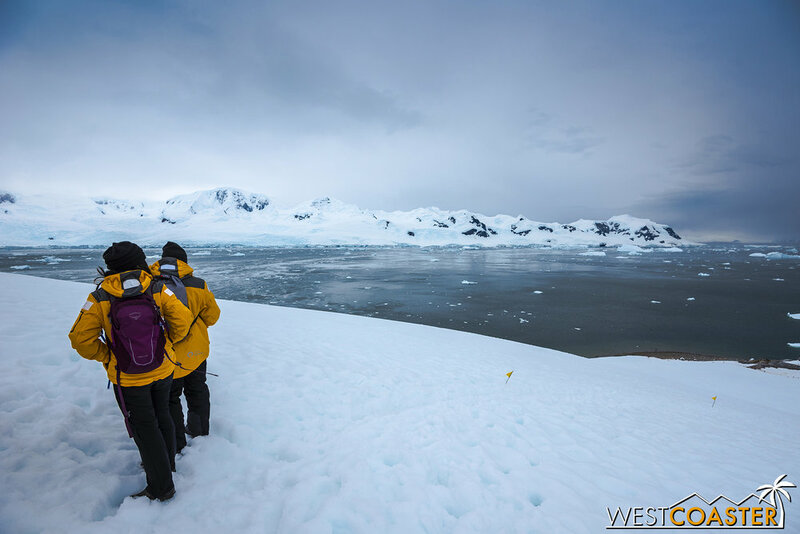 Our afternoon would feature a cruise through the perilous Lemaire Channel into Pléneau Bay, where we would observe a dramatically named "iceberg graveyard." Just the idea sounded exciting! But first, lunch.